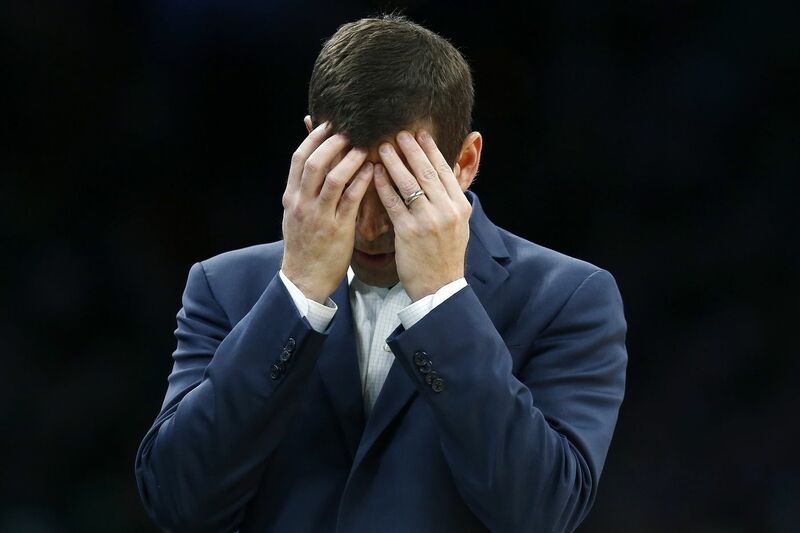 The Boston Celtics and coach Brad Stevens have experienced their share of headaches recently. BOSTON — Celtics forward Marcus Morris surveyed the rest of the Eastern Conference on Thursday night after a loss to the Los Angeles Lakers, and noted the moves that top teams had made at the trade deadline in their pursuit of an NBA title while Boston remained relatively quiet. But by Saturday, after a second consecutive loss at home to a Los Angeles team, the fun was forgotten and Morris had had enough. The Celtics had blown a 28-point lead to the Clippers and were booed off the court. Despite a 35-21 record, playing as a team, being on the same page, and trusting one another has been difficult to come by for Celtics players. The team has been shrouded by drama even when it’s on a winning streak. Team meetings have been held, players have taken shots at each other in postgame comments, and arguments have erupted on the court. Kyrie Irving, who has said his fair share to reporters about the attitude of his team and has wavered on his commitment to stay with the Celtics beyond this season, was injured in the first half Saturday and listed as out for Tuesday’s game with a strained right knee. The injury is one more bump in the road during a tumultuous season for the Celtics, and things are going to get only more intense. Tuesday, the Celtics will be in Philadelphia to face the 76ers in the teams’ third regular-season matchup, after beating the Sixers in the previous two contests. This will not be an ordinary February stop on the schedule. Tuesday’s game will carry a ton of weight. On the other side, the Sixers need to beat the Celtics. All the Sixers’ trade-deadline moves — dealing for Tobias Harris and bolstering the bench — were made with a championship in mind. But to even be considered a contender, the Sixers need to prove they can get past the Celtics, the team in the East that has routinely had the Sixers’ number. Celtics Terry Rozier (12), Al Horford (42), Jayson Tatum (0), and Marcus Morris walking to the bench during a timeout in the second half against the Clippers on Saturday. If the Celtics walk into the Wells Fargo Center and lose to the Sixers, the domino effect could be massive. Irving will head into this offseason with a great deal of power that could shift the trajectory of the Celtics’ future. If Irving decides to leave Boston, the Celtics’ chances at winning the NBA arms race and acquiring Anthony Davis will be all but dashed. Losing to the Sixers, falling in the standings, and further dysfunction could force Irving’s hand. Make no mistake: The Celtics are very aware of what they will be walking into Tuesday. Morris said he pays attention to what the Sixers are doing not only because he is from Philadelphia but also because he understands the Celtics’ position in the East. So when Morris saw what the Sixers did before the trade deadline, he knew it was going to make their Tuesday matchup interesting. “Great moves,” Morris said. “I love Tobias; we’ve been really close since we played together in Detroit. That was a great pickup for them. I’m watching. This is a team that you’ve got to compete against, so I’m definitely watching. They’re making a push, and the league is on notice." Tuesday’s game will mark the finale of a brutal 12-game stretch for the Sixers, in which they have gone 7-4 so far — an absolute victory considering the competition. After Sunday’s win over the Lakers, the Sixers (36-20) were fourth in the East, one game ahead of the Celtics and 5 1/2 games behind the conference-leading Milwaukee Bucks. The Sixers would love nothing more than to beat the Celtics, get an easy win Wednesday against the Knicks in New York, and head into the All-Star break just shy of 40 wins, having put the league on notice in an explosive way.